Water (Purified Aqua), Butylene Glycol, Lactic Acid, Propylene Glycol,Hydroxyethylcellulose, Phenoxyethanol, Polysorbate 20, Silanediol Salicylate, Sodium Hydroxide, Beefsteak (Perilla ocymoides) Leaf Extract, Disodium EDTA (Citrus aurantium dulcis) Oil, Olive (Olea europaea) Leaf Extract, Vitamin B3 (Calcium Pantothenate), Common Purslane (Portulacaoleracea) Extract, Metylisothiazolinone, Maltodextrin, Vitamin C (Sodium Ascorbyl Phosphate), Vitamin B6 (Phyridoxine HCI), Vitamin E(Tocopheryl Acetate), Silica. Used for 2 days, my milla are reduced in size. My mom tried it too, used 1 day then the other day the milla come out easily. Highly recommend to purchase. I have used this 2 weeks but the milia under eye is still there. I wish that bliv could upload a video with the correct way to apply this. I not sure about how to use this product. But i just apply it with the bottle provide small tiny brush on my milia and is starting like watery then midnight when i awake i accidentally rub eyes i can see a thin layer of the product i apply on can be rub off like a thin layer of transparent paper. Still using it. I hope it works on me. Lucky yo have a 14 days trial on Milia Banisher. The product is easy to use and control. Light gel which cause no burden on skin. The result is amazing which some milia being minized in 8 days and no new milia after 14 days. I will keep on to use and recommend to friends. This eye product can helping me to solve and decrease the 眼油脂粒，liked it is depressed. A lot of thanks!~ it is working well done, I will introduce my friend to try this eye product. The eye blash is easier to take this gel into the eye shadow area. I received the i'm milia banisher as part of the 14 days trial. I love this product as it reduced my milia. It is suitable even for my sensitive skin! I'll keep using it unit they are disappear completely. Thank you B.liv for this amazing product! Received this product as of the 14 days trial. And this product is really amazing when i received it and how it work. After using this product at night, i really find it is workable and help remove milia. Love this product. Thanks, Bliv. I ve got i’m milia banisher 14 days trial campaign, it really works. It feel light and it seems my milla is reduced. Keep using! I received this as part of the 14 days trial. I was impressed by the ingredients listing and the product packaging. It is easy to apply, with a thin brush. After nearly a month's use, my milia hasn't been banished unfortunately or reduced. I'll keep staying hopeful and continue to use. I am one of the lucky participants in 14 days trial campaign. I used it every night for 2 weeks and found out my milia have reduced in size and also in quantity! Kinda love the results and will continue using until they disappear completely. Thank you B.liv for the amazing product! It really works for me. I have used it for a couple days. I hav sensitive skin but this product is right and suitable for me. Easy to use. Thumbs up! Good product. I have received the product 2 weeks ago, it has lighten my milla. Hopefully in another 2 weeks it will be gone for good. Great product. No irritation to the eyes as well when using the product. Strongly recommend to everyone. Thanks for the milia banisher of the 14 days trial. My milia did reduced slightly but does not disappear yet. Maybe it takes time. I will continue using and hope to see the effect soon. I've joined the 14 days trial for this product and my milia actually became smaller but doesn't disappear after two weeks plus using it. I have several milia seeds around the eye area in recent years. The milia banisher is easy to apply on problem spots. After the 14-day trial, I did see a slight reduction of my milia seeds and notice the skin is less dry. I will continue to use it to see if the milia seeds will completely disappear. Thank you for the great product. PS: If you have something to remove milia seeds, maybe you could formulate one to remove skin tags which is even more troubling to me. Received my 14 days trial Milia Banisher, I can see the results after use. The size of milia seed is smaller but is still there. Used this for about 2 weeks now, the liquid is clear and does not irritate my skin especially the sensitive area below my eyes. My milk spots size did reduce but did not entirely go away, I guess it needs more time and will probably go away with repeated use. I've got this milia banisher from 14 days trial campaign and it actually worked! I have used for few days and milia on my eyelid became smaller. Impressive! Hopefully it will disappear thoroughly with continuous usage. I have used this once daily for at least 7-8 times now for the milia seed under my eye. The application tip is very convenient as it targets the small area really well. The gel like liquid is clear in colour and feels slightly cooling after application. While my milia seed is still there, the size has definitely reduced by around 30-40%. I'm hoping that with continuous usage it will go off eventually. Worth trying! I applied it onto the milia twice a day and amazingly it disappear after 6 days application. It also do not irritate my sensitive skin. Its a saviour for me. got a retail-sized sample and have been using it for 14 days. i think it's due to my stubborn milia which has been there for years which is why the milia banisher couldn't remove them. it tended make my skin peel a bit (could be due to the regeneration effect) but my milia seeds are still there. 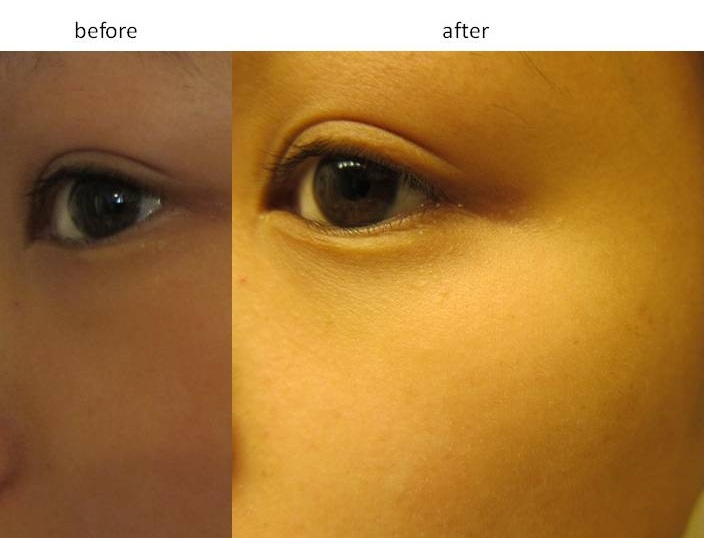 It works to reduce the appearance of milia, they are no totally gone but definitely less noticeable. Wow! Effective and Powerful. After using for 14 days, my eyes are more hydrated and removing the milia under my eyes. Thumb up and will recommend to my friends too! this product does worked in reducing my milia but it can only be proved by touching it. i noticed that it has shrunk when i run my finger on the milia however if i observe it, my milia is still visible and i dont think the size has reduced, its just the texture has thinned when i feel it it with my finger. overall i think it is a good product and i would continue using it, perhaps long term usage would help in banishing my milia because it took a long time for me to notice the difference. Like it so much. Milia become smaller. This product did helps to reduce the oil seed around my eyes, and improve the dullness of my eyes area. The size of some big milia around my eyes reduce to smaller size after I used the product for few days. Definitely a nice product and worth to give it a try. Yes amazing! It really works on removing milia on my eyelid. Thumbs Up! There is some visible improvement that I can see. The milias on my face do shrink a little but the progress takes a longer time than I expect. Overall not a bad product to try on. Will continue to use hopefully will shrink more and disappear! tried this product along with my sister and she had a better result with the product. As her milia seeds are more obvious and protruding, she saw greater results. Based on her feedback, she can feel the difference as she run her fingers over the milia seeds when applying moisturizer on her face. Appearance-wise she wasn't able to tell if it was reduced as her milia is still visible but in terms of touch/feel, she mentioned a significant reduction in the size of bumps. Personally, I will require a more longer usage to be able to see if there's any significant difference. I have oilseeds on my eye areas for many years. This product does work, it removed one of the oilseeds at the first day I used it. However, it was not so effective later. I have been using this for over two weeks, and actually it has been almost used up. It removed four or five oilseeds, but there are still several remained. I think I may need another one to remove the remaining ones. I have found this product works brilliantly! I had a milia on my eyelid, another under my other eye and one on the inside corner of my lip. Within three weeks of applying this product every day, all of them have almost gone. One thing I will say is that I found as the milia dry out it is worth a little gentle rubbing of the area to help exfoliate the dead skin cells away, but be very careful not to make the area sore if yo do this. This helps remove it layer by layer as it dries out. I am so happy with this product! I 100% recommend it and I will be happy to try other products by this company. 1) On a scale from 1 (the lowest) to 5 (the highest) how would you rate the product you tried? I woud rate it at a 2. 2) What do you think about the packaging of the product? I love the packaging. It's something that can be easily carried around for traveling and it's very sturdy. 3) Did you notice any visible improvements? I did not notice any visible improvements. 4) Write your review about the product in the space bellow including your overall thoughts of the product (around one paragraph) I used this product for about a month every night and every morning. It had a slight sting which I could handle. My milia did not improve at all. It was still visible and still there. I really wish that this product had worked for me.